In other words, discovering passion requires a dedication to unstructured exploration. You have to leave large swathes of free time in your schedule (a technique I call underscheduling), and fill this time with the exploration of things that might be interesting. In The first step is to start, Jason Zimdars provides a glimpse of when to start this exploration: Right now. Many times, the reasons of why we don’t start something have nothing to do with the lack of skills, materials or tools. The true obstacles are self-criticism and excuses. 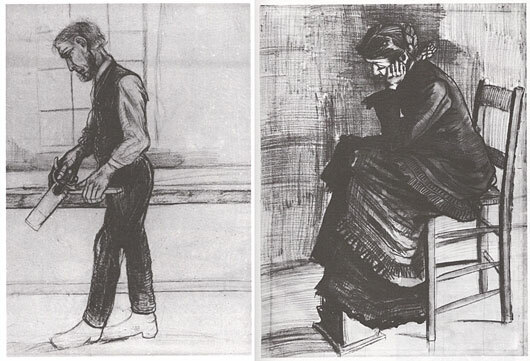 In the book Drawing on the Right Side of the Brain, Betty Edwards reminds us that Van Gogh was only an artist during the last ten years of his life, and shows us a comparison between one of the artist’s first drawings and another one done a couple of years later (see above). Van Gogh did not start by being a master; he was not a child prodigy. He learned by working hard and pursuing one of his passions. It is never too late to find your passions, but it is always late to start looking for them. I invite you to leave your doubts aside and explore. Fight against self-criticism, stop wasting time and start exploring the borders of your self-imposed limitations. At the end of the day, the worst criticism, the toughest self-examination, will be the one at the end of your life, when you ask yourself why you didn’t pursue your passions.